Polybutylene succinate (PBS) is a biodegradable thermoplastic polyester resin synthesized by polycondensation of succinic acid with 1, 4 butanediol. Polybutylene succinate (PBS), also referred to as polytetramethylene succinate is metabolized by microorganisms present in the ground and belongs to the family of biodegradable polymers. Globally, development of efficient and advance technology, rising demand for biodegradable polymers, increasing usage in agricultural applications such as for mulch films, and growing demand from packing industry are the prime growth drivers of global polybutylene succinate market. 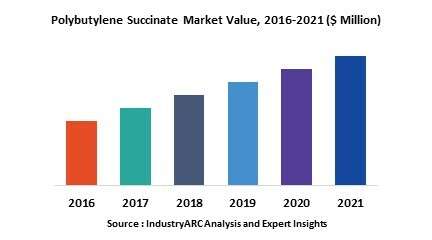 In addition, growing popularity of bio-based polybutylene succinate from bio based 1, 4 butanediol and succinic acid., increase in adoption of polybutylene succinate for applications in newer industrial vertical, and emerging economies such as China, India and others, will create new opportunities for global polybutylene succinate market. However, higher cost of the research and development, volatile prices and supply of crude oil, and stringent government regulations and complex approval process are the key restraints for global polybutylene succinate market. Geographically Asia Pacific dominated global polybutylene succinate market and is projected to have fastest growth, owing to rapidly increasing automotive industry, rise in textile production, favourable government policies, higher market volumes of packing industry, and growing consumer goods industry in developing nations such as China, and India in this region. Among all the application, packaging industry has the highest market share in global polybutylene succinate market. Conventional polybutylene succinate has approximately 90% share in global polybutylene succinate market. This report identifies the global polybutylene succinate market size in for the year 2014-2016, and forecast of the same for year 2021. It also highlights the market drivers, restraints, growth indicators, challenges, and other key aspects with respect to global polybutylene succinate market. Kingfa Science & Technology Co.